Size: Up to 8 or 9 feet. Growth Form: Shrub or small tree; plants with many branches, whitish barked, resinous-viscid, glabrous. Leaves: Green; leaves absent below (denuded), stems leafy above; alternate; shape linear-filiform; leaves gland dotted. Flower Color: Yellow; flower heads solitary on tips of branches; peduncles present; disk florets only; fruit an achene. Flowering Season: March to June, typically following monsoon rainfall; again in December through May. Elevation: Up to 5,000 feet but commonly lower; up to 4,200 feet in California. Habitat Preferences: Dry rocky slopes, among boulders, desert scrubs; soil types granite, limestone, sandstones and volcanics. 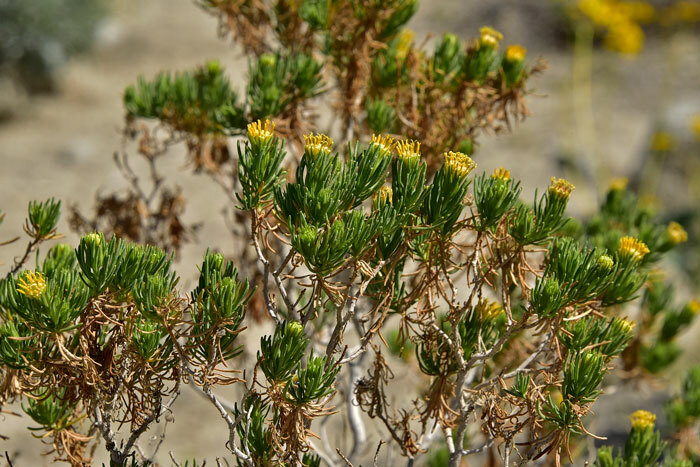 Recorded Range: Peucephyllum schottii is found in the southwestern United States in AZ, CA, NV, UT. It has a limited distribution in Arizona where it is found in Mohave and Yuma counties. 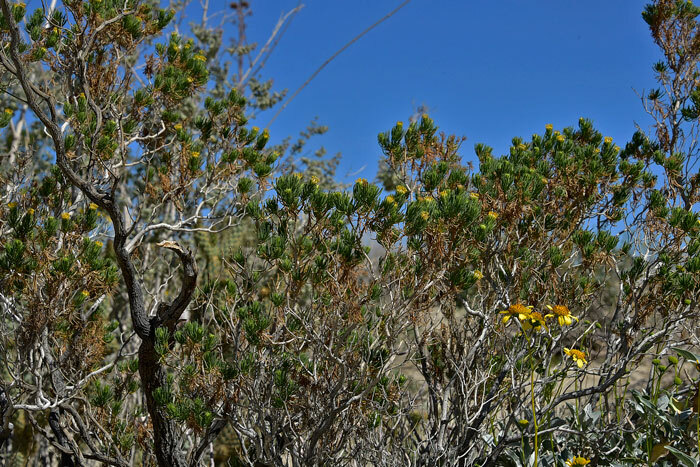 Schott's Pygmycedar is also native to Baja California and northwest Mexico. North America & US County Distribution Map for Peucephyllum schottii. Genus Information: In North America there is 1 species and 1 accepted taxa overall for Peucephyllum. 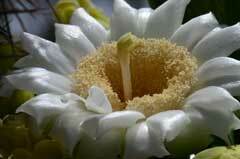 World wide, The Plant List includes 1 accepted species names and includes a further 1 infraspecific rank for the genus. 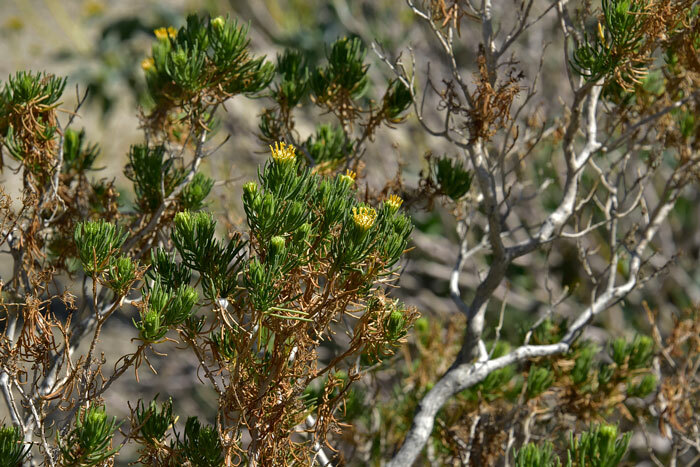 In the Southwestern United States there is 1 species of Peucephyllum. All data is approximate and subject to taxonomic changes. 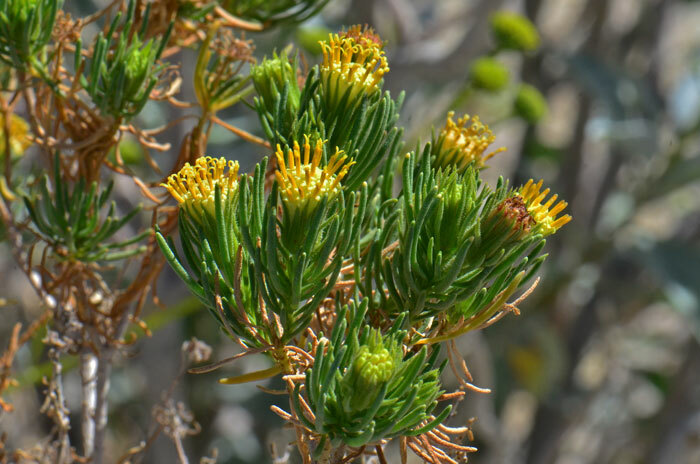 Comments: Peucephyllum schottii is a large shrub or small tree, an interesting growth form for a member of the Asteraceae family in which most species by far are annuals and perennials herbs. The Plant List (2013). Version 1.1. Published on the Internet; http://www.theplantlist.org/ (accessed 12/05/2016). John L. Strother, FNA |FNA Vol. 21 Page 378, 379; | Asteraceae | Peucephyllum; Flora of North America Editorial Committee, eds. 1993+. Flora of North America North of Mexico. 16+ vols. New York and Oxford. SEINet synonyms, scientific names, geographic locations, general information - (accessed 12/05/2016).